Continuing on with my thoughts about the importance of beliefs, I want to first re-affirm that creation/evolution is not a gospel issue. Those who reject young-age creationism (or believe it) can still be Christians, but that doesn't mean that our beliefs about creation don't matter. I was reminded of that just now when I got a message from a friend who teaches at a Christian high school. I don't know all the details, but the story is frustratingly familiar. I've changed some of the details here to protect privacy and because the details are kind of irrelevant - this kind of stuff keeps happening again and again and again. When will we learn? My friend told me that his school hired a new science teacher this year, but no one bothered to ask what she believed about creation. Apparently, she's not a young-age creationist, and the students are up in arms. I shudder to think how this is going to end. So what if it's not a gospel issue? About a month ago, I posted an article that apparently really hit a chord with a lot of people, But is it a gospel issue? I chastised people for using the phrase "gospel issue" too flippantly, where everything and anything related to the good news of Jesus Christ had become a "gospel issue." The post was inspired by an article from Christianity Today that described environmentalism as a "gospel issue." I want to return to this question of our treatment of our environment, because there's still an important lesson to illustrate and learn: Not being something is not enough. If our treatment of the environment is not a gospel issue, then what is it? This Thursday (October 20 at 7 pm), Core Academy is sponsoring an event called Pies and Prayers for the local Dayton community. 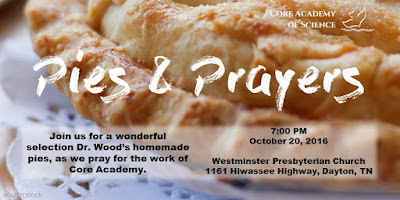 I'll be serving five of my pies, and we'll spend time praying for the work of Core Academy. In case you're curious, the pies are Triple-Layer Pumpkin pie, Apple-Cranberry pie, Quince tart, Maple Cream tarts, and English Mince tarts. It's the flavors of fall. Click here for more information. Core Academy is also giving away free science equipment to Christian schools in January. We've already had a great response to this opportunity, so if you know a Christian school that could use a few microscopes or other eqiupment, point them to our website. The deadline for submitting proposals is November 7. The proposals are easy, just a form to fill out. There's no reason not to submit one. Click here for more information. For those just joining us, I am reviewing the various issues related to the genealogies of Genesis 5 and 11 (see part 1 and part 2 of the series). My goal is to better understand what we evangelical Christians ought to believe regarding the lifespans of ancient humans before and after the Flood. 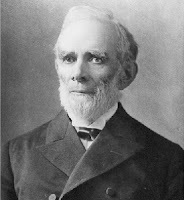 This week, we continue our discussion with a review of William Henry Green's 1890 article "Primeval Chronology," published in Bibliotheca Sacra (vol. 47, pp. 285-303). Green was a well-known Presbyterian theologian and for nearly fifty years a professor at Princeton Theological Seminary. Since his article is widely cited and influential, it makes sense to begin our close inspection of the Genesis genealogies here. You can find a free copy easily using Google. News reports this morning celebrate newly-discovered footprints "from the dawn of modern humanity." They aren't. They're quite recent, actually. Even by conventional dating, they are at best from the "evening" of modern humanity. They are near Engare Sero, Tanzania, which is the same general area as the Laetoli prints, but I don't think they're the prints I blogged about this past summer. Those prints were supposed to be very old and very close to the existing Laetoli tracks. These new prints are conventionally dated to 10-20 thousand years ago, and it was apparently quite a complicated task to get them dated. Liutkus-Pierce et al. 2016. Radioisotopic age, formation, and preservation of Late Pleistocene human footprints at Engare Sero, Tanzania. Palaeogeography, Palaeoclimatology, Palaeoecology DOI 10.1016/j.palaeo.2016.09.019. 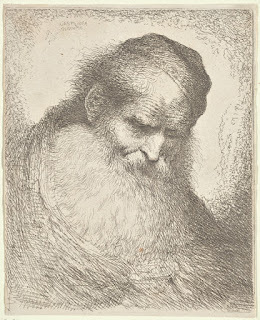 Judging by the correspondence I received about the previous post on human lifespan, my readers have a great interest in the ages of the Old Testament patriarchs and the genealogies of Genesis 5 and 11. These passages have a special importance to young-age creationists, since it is by adding up the ages recorded there that we estimate how old the earth really is. 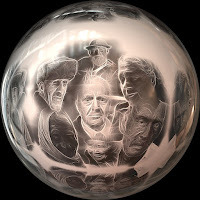 I was reminded by a reader that these ages also hint at an eschatological importance, since we will be given a new body and live forever in that new body. If we believe that, why is it so hard to believe that we once lived much longer than we do now? What's the deal with Drepanosaurus's arm? A newly-discovered fossil from the Triassic Chinle Formation of New Mexico has an arm with a completely unique and bizarre arrangement of bones. Described by Pritchard et al. 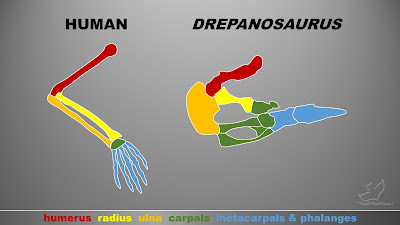 in Current Biology, The fossil is a reptile called Drepanosaurus, and its forefinger is enlarged like a digging tool. That would be weird enough, but the lower half of its arms also have strange-looking wrist bones. In humans (like most vertebrate animals), there is one bone in the upper arm (called the humerus) and two bones in the lower arm (called the radius and ulna). We have tiny little wrist bones called carpals, and then come our finger bones (metacarpals and phalanges). This Drepanosaurus fossil has a humerus, radius, and ulna, but its carpals are enlarged and look like an extra radius and ulna. The forefinger is enlarged to look like a digging tool (it has other fingers not shown in the above diagram). Neandertal infant burial in Spain? News articles last week in El País and New Scientist report the discovery of a Neandertal infant burial in an ancient cave about 58 miles north of Madrid, Spain. As far as I can tell, there isn't a full paper on this, but you can find an abstract from the 2016 conference of the European Society for Human Evolution (on p. 41 of this PDF). The abstract describes the discovery of Des-Cubierta cave in 2009 and the subsequent excavation of Late Pleistocene remains of a Neandertal child. The remains consist of a few teeth and a jawbone. The remains were found near a hearth and surrounded by smaller hearths with the remains of horns and antlers of aurochs, bison, and red deer. The hearths do not appear to be the remains of cooking hearths or funeral pyres, and the animals from which the horns and antlers were taken are conspicuously absent. The site also contains Neandertal-style stone tools, confirming the presence of Neandertals.